1st - Neil Inglis - 0 lb 02 oz - 1 fish. 2nd - N/A - lb oz - fish. Total weight for the season - 2,170 lb 02 oz. *New WSAA Record - Denis Thompson - 341 lb 15 oz. 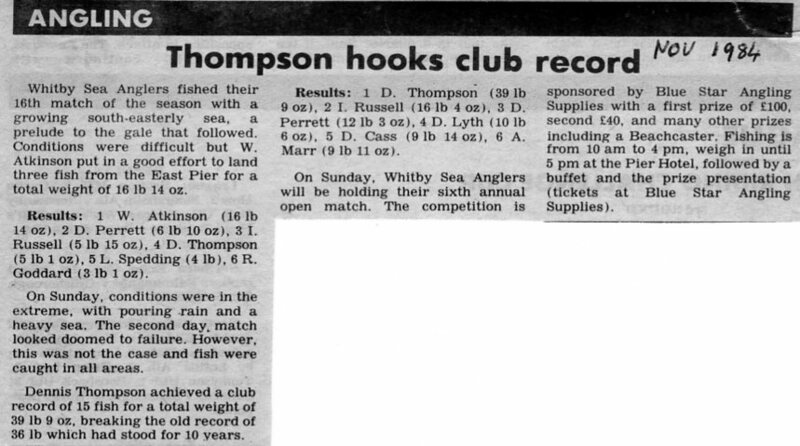 Wednesday 26th September 1984 (1st match) - Denis Thompson 1 fish of 9 lb 08 oz. Sunday 4th November 1984 - Denis Thompson 1 fish of 8 lb 12 oz, part of a 17 lb 11 oz bag. 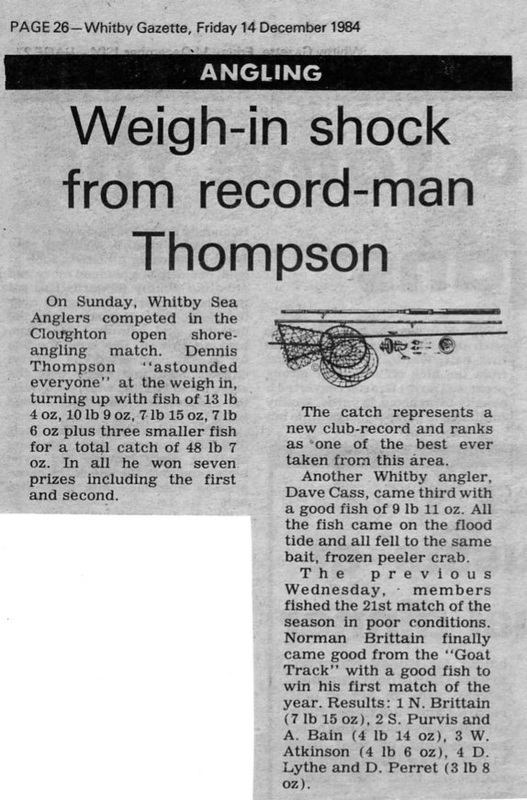 Wednesday 7th November 1984 - Shore League Competition (20 took part) and 17 weighed in 122 lb - average 7 lb 02 oz. - Andy Marr Heaviest Bag 20 lb 04 oz. 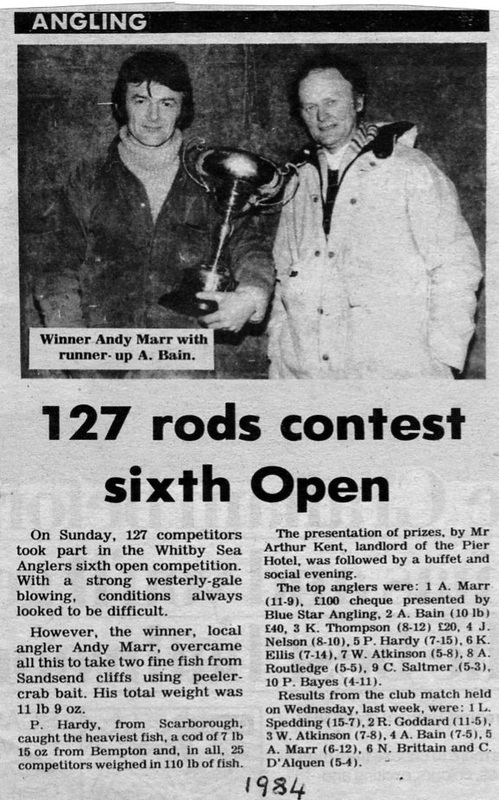 Sunday 11th November 1984 - Andy Marr Heaviest Bag of 30 lb 01 oz. Sunday 18th November 1984 - Denis Thompson Heaviest Bag of 39 lb 09 oz. 26th November 1984 - Denis Thompson and Dave Johnson 1 fish of 8 lb 10 oz, Heaviest Fish out of a match. Sunday 9th December 1984 - Cloughton Open - Denis Thompson Heaviest Bag of fish of 48 lb 07 oz and Heaviest Fish in a match 13 lb 05 oz. 17th December 1984 - Dave Lythe Heaviest Fish out of a match 11 lb 02 oz. 23rd December - G Hall a bass of 0 lb 15 oz. 11th January 1985 - M Kilpatrick, Heaviest Fish out of a match 13 lb 06 oz. Wednesday 16th January 1985 - Dave Cass 1 rockling of 1 lb 08 oz. Taken from ledger filled in by Les Spedding. Whitby Sea Anglers fished their 16th match of the season with a growing south-easterly sea, a prelude to the gale that followed. Conditions were difficult but W Atkinson put in a good effort to land three fish from East Pier for a total weight of 16 lb 14 oz. 6 - R Goddard (3 lb 1 oz). On Sunday, conditions were in the extreme, with pouring rain and a heavy sea. The second day match looked doomed to failure. However, this was not the case and fish were caught in all areas. Denis Thompson achieved a club record of 15 fish for a total of 39 lb 9 oz, breaking the old record of 36 lb which had stood for 10 years. 6 - A Marr (9 lb 11 oz). On Sunday, Whitby Sea Anglers will be holding their sixth annual open match. The competition is sponsored by Blue Star Angling Supplies with a first prize of 3100, second £40, and many other prizes including a Beach caster, Fishing is from 10 am to 4 pm, weigh in until 5 pm at the Pier Hotel, followed by a buffet and the prize presentation (tickets at Blue Star Angling Supplies). On Sunday, 127 competitors took part in the sixth open competition. With a strong westerly-gale blowing, conditions always looked to be difficult. However, the winner, local angler Andy Marr, overcame all this to take two fine fish from Sandsend cliffs using peeler-crab bait. His total weight was 11 lb 09 oz. P Hardy, from Scarborough, caught the heaviest fish, a cod of 7 lb 15 oz from Bempton and in all, 25 competitors weighed in 110 lb of fish. The presentation of prizes, by Mr Arthur Dent, landlord of the Pier Hotel, was followed by a buffet and social evening. 10 - P Bayes (4-11). 6 - N Brittain and C D'Alquen (5-4). 7 lb 6 oz plus three smaller fish for a total 48 lb 7 oz. In all he won seven prizes including the first and second. The catch represents a new club-record and ranks as one of the best ever taken from this area. Another Whitby angler, Dave Cass, came third with a good fish of 9 lb 11 oz. All the fish came on the flood tide and all fell to the same bait, frozen peeler crab. The previous wednesday, members fished the 21st match of the season in poor conditions. Norman Brittain finally came good from the "Goat Track" with a good fish to win his first match of the year. No detail as to how many members fished. On Saturday, 63 members and guests of Whitby Sea Anglers attended the annual dinner/prize presentation. Trophies were presented by Mr S Cartridge and a report of the past season's activities was read by Chairman W Atkinson. 7 D Cass (140 lb 7 oz). heaviest single fish caught out of competition; M Kilpatrick (13 lb 6 oz). The past season can only be described as the best ever, with no fewer than three records broken and for one angler in particular it was a fantastic season - Denis Thompson, with a total weight of 341 lb 15 oz, was 144 lb over the old record. In just four day matches, Mr Thompson caught 132 lb 10 oz. Other notable catches were 20 lb 4 oz and 30 lb 1 oz by A Marr in November and 26 lb 12 oz by Les Spedding in January. Another new record set this year was the total weight caught by everyone in the club (2,170 lb 2 oz) - just 70 lb short of a ton. In the Blue Star Open in November, 120 anglers fished and were led home by local angler A Marr with two codling for 11 lb 9 oz. In the Northern Federation, Whitby A team were narrowly beaten in the final by Shiremoor C and Whitby also won the Northern Federation Shore League at the first attempt, beating such teams as Whitley Bay and Filey. All in all, the past season was truly exceptional for Whitby Sea Anglers.